The rise in fiber adoption by service providers is great for those who manufacture the cables, but it’s causing a headache for many who have to commission it. More and more, higher fiber-count cables are being laid, leading to a challenge for installers and contractors: how to manage, track and report on the test and certification of the individual fibers and the cable as a whole. The questions are many: how far along are you in testing all the fibers? Did you already test this or that fiber? Did it pass or fail? Where is the test result so you can check? And how do you consolidate a bunch of individual test results into one certification report? Without a clear and simple view of where you are with your project (and a little bit of automation), you can waste a lot of time figuring these things out, potentially duplicating tests (accidentally testing the same fiber twice) or worse, missing a fiber and having to return to site (at your own cost if you’re a contractor) to fill in the missing data. All of which can cost you time, effort, and money, as well as potentially delay fibers being lit and services turned up. What is needed is a smarter way to manage the whole cable testing process — the associated file management plus the certification and reporting. This is where the ‘Cable’ variant of the VIAVI Smart Link Mapper (Cable-SLM) comes in. 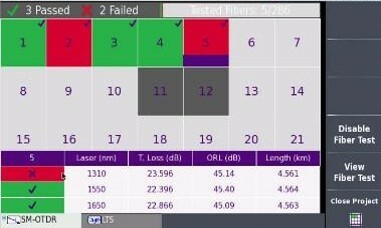 Cable-SLM gives you an up to date view of the progress of your project in a nice simple grid display with a clear indication of which fibers have been tested, which have passed (or failed), which are still to be tested and which have been omitted (no test required). Selecting a square (or fiber) from the grid and hitting the ‘View Fiber Test’ button instantly brings up the OTDR trace and as with all SLM applications the user can toggle instantly between the OTDR trace and SLM icon views making the reading, interpretation and validation of OTDR results easy. As each fiber test is completed, Cable-SLM alerts and instructs you to move to the next fiber and automatically takes care of all the test results naming, storage and file management. Once all fibers in the cable have been tested you close out your project and the instrument will create a consolidated .sor/pdf and summary report file for you which can be taken off the unit via a USB stick or uploaded directly to StrataSync, making it instantly available in the cloud. You can pre-define the test setup (including pass/fail criteria) and customize the cable naming and fiber labeling used for the project management display, test results and certification/reporting. This gives the added bonus of minimizing configuration errors in the field and eliminating any miss-understanding over testing methods and procedures driving better test reliability and repeatability (compliance). If you’re interested, you can see how easy cable certification can be with a free 30-day trial license for Cable-SLM (and FTTH-SLM, FTTA-SLM and Enterprise-SLM). Simply contact your local VIAVI rep or email tac@viavisolutions.com. 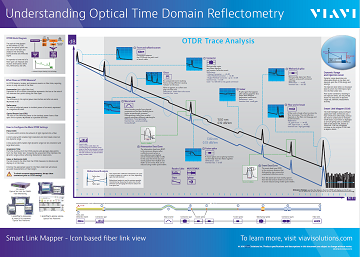 If you want to learn more, visit our Smart Link Mapper web page or download the poster pictured above, Understanding OTDR. Does this program work on all OTDR’s or just JDSU units? Do you provide training on the set up, operation and use of this program? The Smart Link Mapper (SLM) application is specific to the VIAVI range of OTDRs, other brands/manufacturers of OTDR have their own similar capabilities but they tend to be only for interpreting an OTDR trace into an icon based view, what they typically lack are the visual project management capabilities that the Cable variant of Smart Link Mapper (Cable-SLM) provides. Thanks for reading the blog and for your interest.